Scott Bryson, former manager of Bagel Central, became owner of the establishment on Jan. 1, carrying on the tradition of good food and service, and locally celebrated bagels. Bagel Central, an eatery in downtown Bangor with a long history and loyal clientele, has changed ownership, effective New Year’s Day. According to the new owner, not much will change. The friendly staff, varied menu, locally famous bagels and casual atmosphere with communal tables are all here to stay. 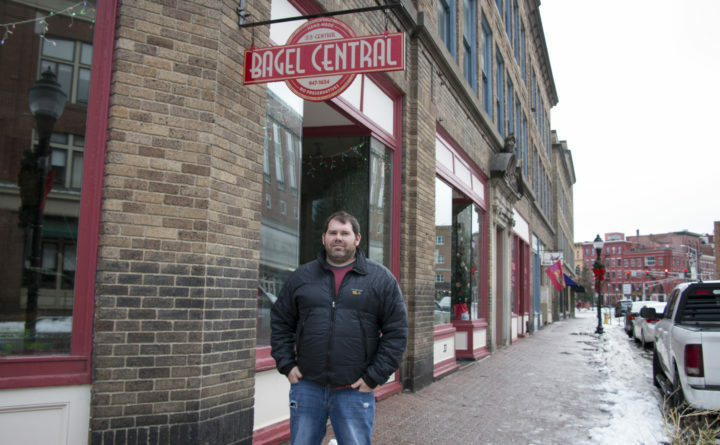 “The recipe for success is already there, so we just have to keep following it,” said Bagel Central’s new owner, Scott Bryson, who worked as manager for the establishment for the past 18 years. Bryson bought the business from Sonya Eldridge, who owned and operated it for the past 20 years. Eldridge couldn’t be reached for comment for this story, and Bryson wasn’t surprised. Nevertheless, Eldridge did share her thoughts about the transition on Bagel Central’s public Facebook page on Dec. 31. In a long, heartfelt post, she announced the change in ownership, reminisced on the years she and her family spent building the business, and thanked the restaurant’s employees and devoted customers. Yet Eldridge still decided it was time to move on. “My new adventure will take me to my flower gardens, my kayak, my hiking buddies, my Mustang, my long-planned cross-country camping trip, and to a 3-year-old [grandson’s] next idea of fun,” she wrote. Eldridge was a longtime employee of The Bagel Shop when she purchased it in 1998, then changed its name to Bagel Central and moved it from its original location at 1 Main St. to 33 Central St. in 2000. At the time, she was a young mother raising two children. Located in the middle of downtown Bangor, Bagel Central became a gathering place for people who work in the area, as well as a destination for visitors, offering a wide variety of sandwiches, soups, pastries, breakfast food and daily specials. It has also become known for its catering services and baked goods, which are handmade with no preservatives. None of that is going to change, Bryson said. Bryson, who lives with his family in Glenburn, began working with Eldridge at The Bagel Shop in 1995, as a cashier. Bryson remembers helping Eldridge move the business to its Central Street location. Since then, he has worked closely with Eldridge to run the restaurant, which underwent renovations in 2015 when it outgrew its kitchen. This past summer, Eldridge approached Bryson proposing to sell him the business. Bryson said he never anticipated becoming the owner but that he’s up for the challenge. While Bryson doesn’t have plans for any big changes to Bagel Central, he is open to making small changes to serve his customers. For example, Edridge recently hired a new pastry chef to “step their pastries up a notch,” Bryson said. And Bryson is interested in introducing more locally sourced and produced items to the menu. But most importantly, Bryson wants to continue to run Bagel Central as a place where the community gathers and eats, and employees enjoy working.